Because raccoons are vectors for rabies and several other diseases, you should contact your veterinarian anytime Fido has contact with a raccoon. If your dog actually bit or tried to bite a raccoon, it's likely the dog got bit, too, and that's where the major risk comes into play. After calling the veterinarian, notify your local health department of the encounter. You must also consult your own doctor if you make contact with the raccoon or his body fluids, particularly his saliva. Rabies spreads via saliva, but other diseases are passed in urine, blood or feces. All dogs should be vaccinated against rabies. In addition to helping to protect your dog from the disease, vaccinations may save your dog’s life, as some public health officials may require euthanasia for exposed unvaccinated animals. 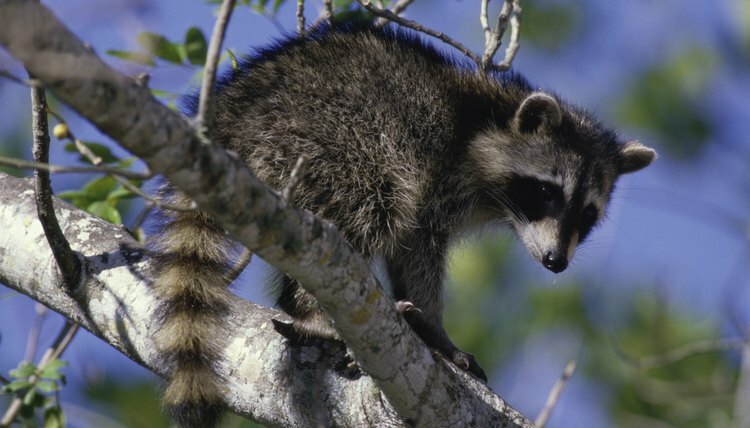 Rabies is not the only concern when dogs and raccoons share bodily fluids; raccoons carry a variety of other pathogens and parasites, and close contact increases the chances of your dog becoming sick. Raccoons may carry a very dangerous roundworm, called baylisascaris, as well as a bacterial infection known as leptospirosis. While no preventative treatment for baylisascaris exists, consider having your dog vaccinated against leptospirosis if raccoons are common in your area.